with only a week to go till the golden egg hunt I thought it would be best to run though the finer details ! 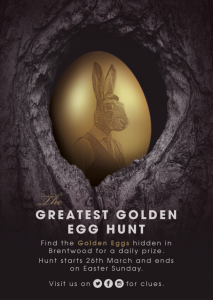 Starting on Tuesday the 26th of March I will be hiding 5 golden eggs somewhere in Brentwood (a different one each day) fo 5 days. Inside each egg there will be a fabulous prize! Everyday i will post a clue on our social media and then happy hunting!